Alone and in silence is the perfect way to see Marguerite Humeau’s latest exhibition at Import Projects and I just got lucky, I guess, shuffling into the gallery as it closed and walking undisturbed through the whole brilliant spectacle. But what can words do to describe Humeau’s Horizons? Language falls flat when passions soar, and awe was the only emotion I could concretely feel walking through the haunting three-room installation. All too often, the story behind an exhibition ends up more fascinating than the work itself, the two appearing to have little in common, as though the true artist was the person responsible for the press release. In Horizons, however, the work and the story weave around each other flawlessly, for once telling the same whimsical story. In the far right of the gallery hangs a massive black shape, a vibrating fighter jet blown up to life-size in black PVC rubber, suspended from the wall and looming diagonally across the room. Around the spaceship, a sound installation forms: a low, ominous hum that builds steadily and crashes ecstatically in unison with those filtering in from the next room. 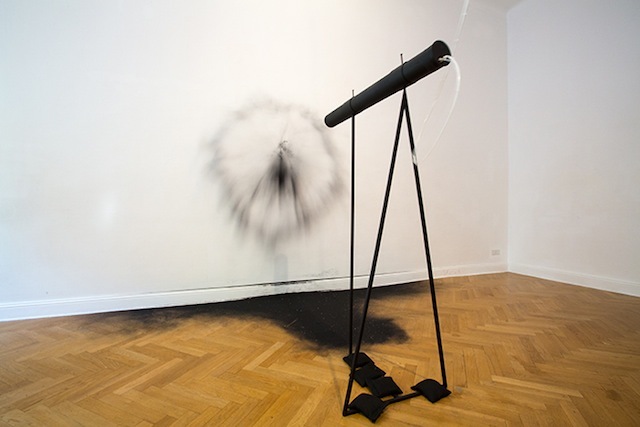 The fighter jet, the story tells us, is caught mid-flight in its fictional journey to Europa, the icy moon of Jupiter, and we catch up with it in the following room as an installation of an air cannon exploding black dust onto a crisp white wall simulates the jet’s crash into the moon’s surface. The execution of the pieces is impressive enough, the emptiness of the gallery made stark by the harrowing sounds that bounce off the walls with frenzied insistence, but it is in the story that the installations find their value. Two years ago, in the underwater volcanos found along the ice caps of Antarctica and thought to be the closest earthly equivalent to Europa’s enigmatic climate, scientists discovered an unidentified species capable of surviving without light or oxygen, communicating only by a combination of sound, black powder, and light—the most alien-like creatures found to date. Humeau’s journey in Horizons is not to the moons of Jupiter per se but to the outer edges of our imagination, to the star-eyed notion that we are not alone and never have been. Marguerite Humeau, ‘Prop 2’ from The Things? series (2014). Photo by Emi Maria Bohacek. Courtesy Import Projects. Having travelled to future dimensions in the far corners of the solar system, the last of Humeau’s installations takes the viewer to primitive times with ‘The Opera of Prehistoric Creatures’. Two large white sound-producing sculptures are fastened side by side, abstracted from concrete shape but evocative of the long-extinct entelodont or “hell pig” and the ancient mammoth. With the help of palaeontologists, zoologists, surgeons and, among others, engineers, their imagined cries are re-constructed from old fossils, using everything from windpipes and synthetic larynges to AI systems and resonance cavities to give voice to these “frankenstinian sonic agents”. Combined with the grating trinkle of Humeau’s ‘Angelic Organ’, reconstructed from an 18th-century instrument banned due to its rumoured ability to drive listeners insane and marking the entrance to the gallery, the impression of Horizons is captivating, maddening. It is both senseless and completely coherent, a not-too-gentle push into the shadows of imagination and towards a knowledge generated only “through the impossibility of reaching the object of investigation”. Marguerite Humeau, ‘Angelic Organ’ (2014). Photo by Emi Maria Bohacek. Courtesy Import Projects. Perhaps it says something about me that I could have stayed for hours in Humeau’s dark, imagined universe but when confronted with Kate Cooper’s CGI-assisted show, RIGGED, at the KW Institute for Contemporary Art, I wanted only to flee. Nothing is more discomfiting in our modern age than high-definition reality. 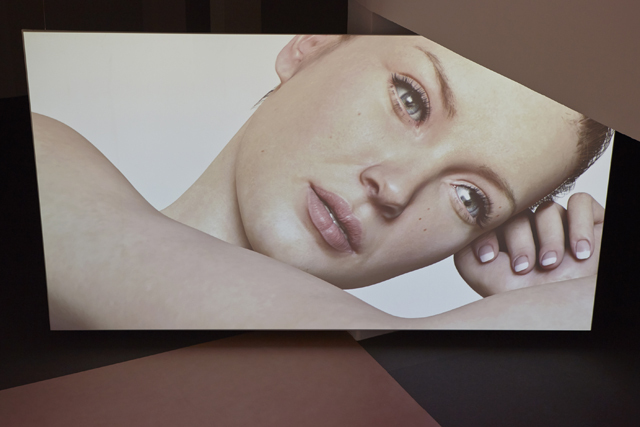 Like Humeau, who won the Berlin Art Week Jury Choice award for Horizons, Cooper’s two-storey exhibition won her this year’s acclaimed Schering Stiftung Art Award. Standing in front of a large screen on to which RIGGED’s only video work is projected, I can understand why, even if I don’t much enjoy what I’m looking at. A woman’s body, slipping in and out of HD realism, is seen from various angles, performing various tasks. She runs. She lies. She stares at the camera with dead eyes enhanced to flicker. In photographic works displayed on the higher connecting floor, she is seen exposing her teeth, around which silver braces and a grey plastic mouthguard are fastened. Despite the visible discomfort, her mouth rests in a soft smile. Kate Cooper, RIGGED (2014). Installation view. Photo by Theo Cook. Courtesy the artist. The aesthetic of the show is repulsive to anyone who, like me, was raised in the age of high resolution. Why else would we filter every photo we take to show wear that was never really there? Looking at the fictional CGI-perfected woman, bought as a stock image by Cooper online and derived from no living human body, the commodification of the self as a reality of the modern world is unavoidable, especially if that self is a woman’s self. Her body, pore-less and hairless and smoothed of all error, is not ours, does not resemble ours, but is nevertheless meant to represent our own flawed bodies, implicitly widening the gap between the reality of our experience and its latent expectation. 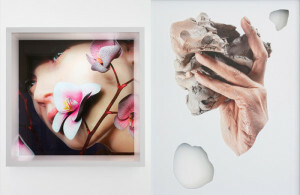 Exhibition photos for Marguerite Humeau’s Horizons (2014), top-right. 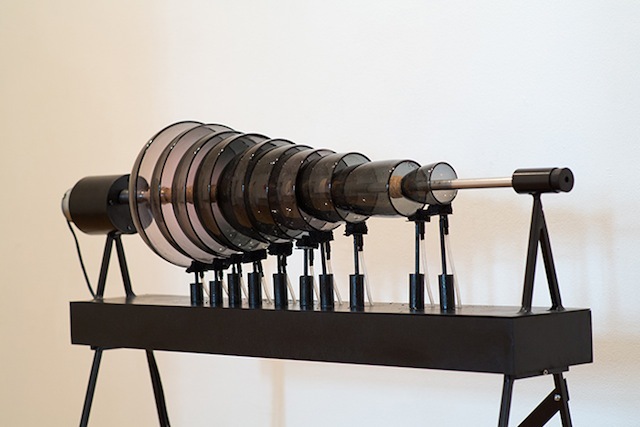 Berlin Art Week 2104 ran at various art spaces and galleries in the German capital from September 16 to September 21. 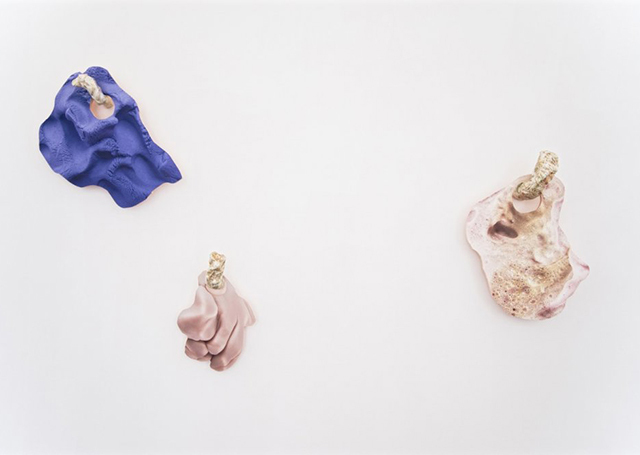 Header image: Kate Cooper, RIGGED (2014). Courtesy the artist.